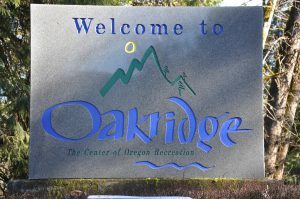 Located 150 miles south of Portland and 40 miles southeast of Eugene on Highway 58 is Oakridge, Oregon–a small community in the midst of a rebirth. In its early days, Oakridge was a rough-and-tumble railroad boomtown in the heart of timber country. For many years the Southern Pacific Railroad hauled a steady stream of timber and lumber to and from the mills in Westfir and Oakridge. First called Hazeldell, then Big Prairie, the town finally landed on a name that stuck with Oakridge in 1912. For nearly 80 years, the town’s population was comprised largely of lumberjacks and railroad men, but starting in the early 1990’s more and more recreation-minded adventurers with mountain bikes, fly rods and hiking boots became part of the mix. Today, Oakridge touts itself as the “Mountain Biking Capital of the Northwest” and is a perfect central staging point for outdoor enthusiasts of all types. Bringing new life into Oregon communities through cycling is very much our mission at Cycle Oregon and we’re thrilled to see it at work in Oakridge. Like all great adventure hamlets, Oakridge is ideally located. 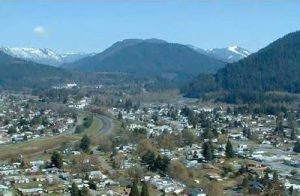 The town sits between 1,200 and 1,600 feet of altitude and is nestled in the foothills of the Cascade Mountains, surrounded by Willamette National Forest. It is halfway between two sizable man-made lakes–Lookout Point Lake and Hills Creek Lake– and is within a short drive of Diamond Peak Wilderness, Willamette Pass Ski Area, Waldo Lake (the purest Lake in Oregon), Salt Creek Falls (one of the largest falls in Oregon) and McCredie Hot Springs. On top of all that, some of the best trout fishing in the northwest can be found on the Middle Fork of the Willamette River which flows right by Oakridge. In Oakridge, most outdoor excursions start at Willamette Mountain Mercantile and end at Brewers Union Local 180. Willamette Mountain Mercantile is kind of like an unofficial concierge service for Oakridge. The knowledgeable staff is happy to help you plan your adventure, recommend food and lodging, line up shuttle service, and rent you any gear you may need. The shop is hard to miss–the storefront looks more like they would deal in hard tack and wagon tongues than high-end mountain bikes and gear. After a day of bombing singletrack on the area’s 350 miles of trail, cycling along the many gorgeous roads, or hiking any number of nearby trails, the best thing to wash the dust out of your throat is a delicious craft beer. This can be achieved easily enough at Brewer’s Union Local 180, an English-style brew pub that also serves some of the town’s tastiest food. And if you’re looking for something a little stronger, Deep Woods Distillery, Oregon’s newest and smallest craft distillery, is only four blocks away. For food options, Big Mountain Pizza serves up some great pie, Stewart’s 58 Drive-In for great coffee, breakfast, lunch and dinner, or check out Lee’s Gourmet Garden, where Jackie Chan’s former personal chef will whip you up something that will roundhouse kick you right in the taste buds. Around Oakridge, there are plenty of places to stay. From dispersed camping, to yurts, to motels, to B&B’s. For such a small town, you’ve got options. One place in particular, The Westfir Lodge, has as much history as it has charm. 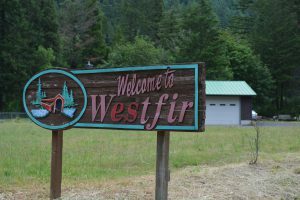 It is situated in Oakridge’s sister city, Wesfir, right next to the big, red, covered Office Bridge. In fact, the Westfir Lodge used to be the main office for the Westfir Timber Company and the original vault is still in the building today. Nearly 500 miles of trails for every kind of outdoor activity make Oakridge an obvious destination for those looking to get out. And once you’re done playing outside, the town itself is as welcoming and accommodating as any place you’re likely to find in the northwest, or the anywhere for that matter. Does Oakridge have areas that will accommodate recumbent trikes? Meaning bike paths/trails. The single track trails will most likely not be wide enough, but there are many road options in the area.